Kempston Cleaning Services is a high quality commercial, industrial & residential professional Commercial Window Cleaning Company. We clean business offices & apartments in high-rise buildings. We provide efficient window cleaning so you can look through those windows and enjoy the view. Our team of trained Window Cleaning professionals are able to get to those windows which you’re not able to reach. Kempston Cleaning Services is a highly respected name in cleaning & Hygiene industry, providing the best possible window washing service. Kempston Window Cleaning serves Cape Town, Johannesburg, Durban, East London & Port Elizabeth. We take pride in our work and strive to provide our customers with superior quality and exceptional customer service. 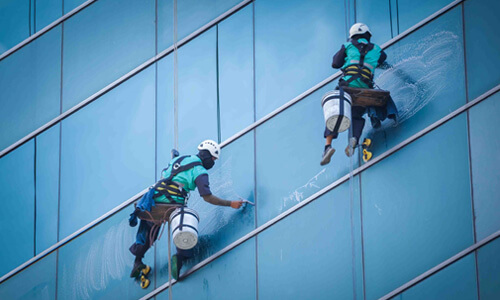 We provide a safe and professional window cleaning service at very competitive prices. With Kempston Window Cleaning, you are always guaranteed excellence at its very best! As a customer, you’ll be treated as if you are our most important customer. We’re devoted to the work we do and strive to achieve the unprecedented results. This is the reason why we’ve earned a such a fantastic reputation with property managers and owners, as the best in our industry. Kempston Cleaning Services offers a host of quality hygiene solutions to help your business comply with the necessary standards required for your industry. Such services include Industrial Cleaning Services, quality cleaning services for Supermarkets & deep cleaning for commercial kitchens among others.